Dotandcross is design for growing up. The series of modular furniture pieces adapts, mixes and matches to grow with your child, their space, and their evolving interests. The range of sustainably sourced, gelati-toned bedroom furniture is designed and made in Italy and was recently showcased at Design Junction in London. The Dotandcross concept was created by design and communication studio, Dogtrot, which is run by Margherita Rui and Alessandro Rado, in collaboration with Daniele Bortotto and Giorgia Zanellato. The philosophy underpinning the range is that a bedroom furnished with multifunctional and adaptable objects will be able to see a youngster through childhood and into their teenage years. Not only are the products themselves sustainably sourced, but they are designed to minimize waste and obsolescence by extending their life cycle. As a child grows and their interests develop and diversify, Dotandcross can grow with them. A toddler’s painting easel cleverly morphs into a low-set desk that can then be recalibrated to fit a lanky, growing body. A cot transforms into a day bed or couch. 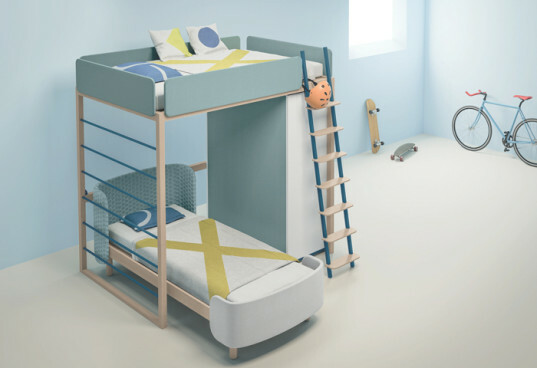 Bunk beds fit with other items in the range like Tetris pieces, accommodating cupboards, wardrobes, a single bed or a desk underneath. If the child moves rooms or the family moves house, the adaptable system can be reconfigured to fit the new space. All solid wood or mixed wood based materials used in the range are FSC certified. The linen range that mixes and matches with the furniture is also made in Italy, and is naturally colored and made of 100% cotton. While we are definitely a little bit in love with the subtle pastel colors, the true genius of this range lies in its adaptability. Anything that saves parents from having to make a new purchase every time their child grows a little is doing more than saving dollars! The Dotandcross concept was created by design and communication studio, Dogtrot, which is run by Margherita Rui and Alessandro Rado, in collaboration with Daniele Bortotto and Giorgia Zanellato. The philosophy underpinning the range is that a bedroom furnished with multifunctional and adaptable objects will be able to see a youngster through childhood into their teenage years. Not only are the products themselves sustainably sourced, but they are designed to minimize waste and obsolescence by extending their life cycle. As a child grows and their interests develop and diversify, Dotandcross can grow with them. Bunk beds fit with other items in the range like Tetris pieces, accommodating cupboards, wardrobes, a single bed or a desk underneath. If the child moves rooms or the family moves house, the adaptable system can be reconfigured to fit the new space. An iconic element of the collection, the convertible bed has been designed following the cornerstone principle of the whole design: flexibility. The particular design is like the affectionate gesture of an embrace. 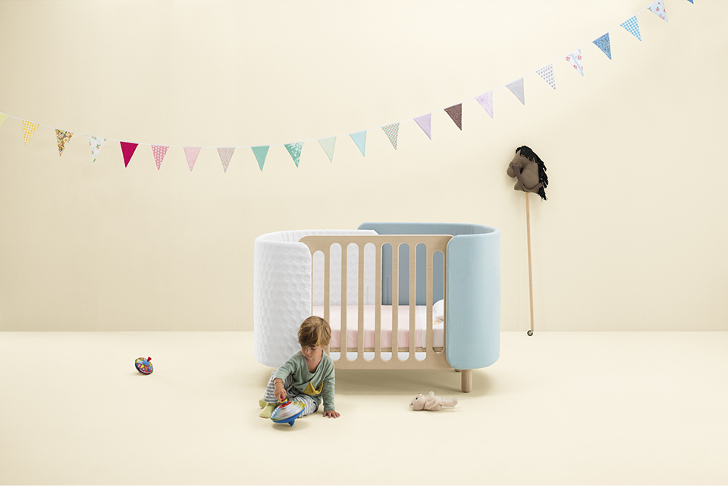 Conceived as a soft comfortable alcove, it is a completely new proposal for interior furnishings for the very young: a welcome retreat where they can not only sleep but also play. It can be easily transformed into a colorful sofa, suitable for a precious space where the child can read or enjoy their quiet time. All solid wood or mixed wood based materials used in the range are FSC certified. The linen range that mixes and matches with the furniture is also made in Italy, and is naturally colored and made of 100 percent cotton. ... a low-set desk that can then be recalibrated to fit a lanky, growing body. The system can be equipped with drawer units available in two solutions – with two or three rows of drawers – and in different colors. The wardrobes offer variable heights and widths. The configuration of the doors and drawers can be customized. There is the option of inserting soft fabric covered back panels, removable, washable and customisable with pockets, where posters or photos can be attached. While we are definitely a little bit in love with the subtle pastel colors, the true genius of this range lies in its adaptability. Anything that saves a parent from having to make a new purchase every time their child grows a little is doing more than saving dollars!